All of our plants are fully rooted, grown and shipped in containers. Our Small Emerald Green Arborvitae is approx. 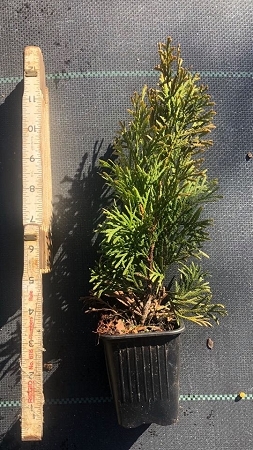 8-10 inches tall and in a 3in container. Shimmering emerald green foliage with a classic narrow, pyramidal form make the emerald arborvitae attractive in all seasons. The emerald arborvitae is slow growing, averaging about 9-12 inches per year once established. Mature height is about 12-15 feet and 3-4 feet wide. Makes for a great specimen or accent plant, hedges, and privacy screens.